There is something symmetrical about the fact that my first week in Jerusalem was taken up with the issues of the relationship between the U.S. and Israel. And what could be more appropriate given that Israel was unhappy with Obama who was too slow and diplomatic along with overly careful about relationships with the Arab world, and Trump is about the opposite. Netanyahu has put together and drifted toward one of the most conservative governments in Israel’s history so it stands to reason that Trump should be more to his liking. But what could really happen? What are some of the issues in the new relationship between the U.S. and Israel? First, there is little doubt that Netanyahu figures his path is going to be easier with respect to settlements. He has tried to walk the line between being supportive of settlements but still managing the international condemnation that comes with it. It was no accident that the announcement of thousands of new homes in the West Bank coincided with Trump’s ascendancy. And Netanyahu has stated rather boldly that he has no intention of giving the Palestinians a state. This is related to a point I’ve been making for some time. Does anyone really think that there’s going to be the creation of a Palestinian state on Netanyahu’s watch? Does anyone really think that Netanyahu is going to be the prime minister who goes down in history as responsible for creating a Palestinian state? Even though Netanyahu is on record as supporting the two state solution, I figure you have to be pretty naïve to think that he actually meant it. Like Trump, Netanyahu will say pretty much anything he needs to say to satisfy the moment. The settlements remain perhaps the most significant obstacles to peace and they continue to be the major point of contention. The US and Israel must put their heads together and work out a common platform designed to support the issues related to settlements. The fact that Netanyahu allows two minor political parties (Haredi and Bayit Yehudi), who are animated by settlement issues, to command so much attention is evidence of both his fragile coalition and the importance of the issue. Both Trump and Netanyahu assume the relationship will be “bromantic.” That is, these two political and ideological brothers who share a common vision of the world – along with a common desire to change directions from Obama – will have a “bromance” hopefully followed by a complete union. But in both love and politics things don’t work out the way you expect. I will just bet, for example, that Netanyahu is not happy about having to deal with Trump’s pesky son-in-law who may be bright and capable but seems woefully unprepared to be in a position to manage the most intractable international conflict in modern history. When I think of distinguished presidential advisers (e.g. Brzezinski, Kissinger) the name Jared Kushner doesn’t come to mind. This is going to be a learning experience primarily for Trump who, as is quite evident, is a newcomer to politics with little knowledge or experience in international relations or policy. Trump’s rather careless statement, for example, about moving the American Embassy to Jerusalem is a good example of his naïveté. He started to back off from this demand as soon as he learned of its provocative nature and the damaging consequences. 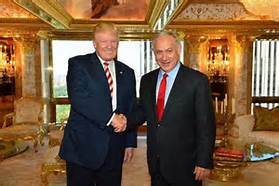 There is little doubt that Netanyahu will try to lecture Trump and “educate” him on the issues. This puts Netanyahu in a power position because he is more able to manage the information environment. But in the end I hope Netanyahu is careful because this is a president who will strike back viciously if he feels manipulated, disrespected, or challenged. Hopefully, Netanyahu will use his skills to do more than “bromance” his friend; rather, he will take this opportunity to direct Trump to that portion of reality that represents what is best for both countries. Posted on February 10, 2017, in Political Conflict and tagged Trump, U.S. Relations. Bookmark the permalink. Comments Off on The New Bromance between the U.S. and Israel.